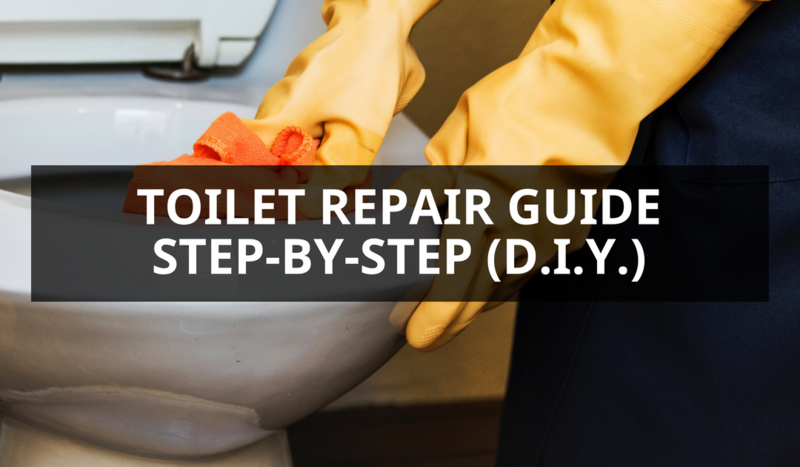 Before you contact a plumber to help install or repair your home toilet, you might want to DIY (do-it-yourself), especially during emergency cases or midnight hours where our plumber guys are not available. 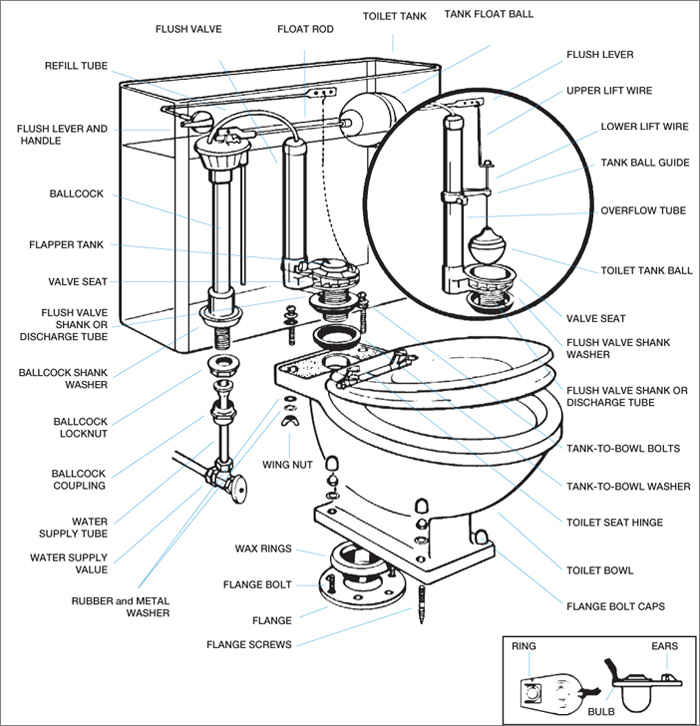 Here are some quick step-by-step guides for repairing and installing different parts of a toilet, including the flush lever, float rod & ball, lift wires, lift chain & flapper, overflow tube, flush valve, wax ring, ballcock and tank-to-bowl washer. Of course, it is still not recommended to do-it-yourself so if you are famous for your “clumsiness” who could potentially ruin everything, call us (Your Plumber Guys) for plumbing services instead. It is not necessary to shut off the water or drain the tank for this repair. Unhook lift wire or chain from the flush lever and unscrew locknut holding handle to tank by turning clockwise. Carefully pull handle out through the hole in the tank wall. Insert new handle into tank, slide locknut over lever onto threaded portion and tighten by turning counter-clockwise. DO NOT OVERTIGHTEN. Reattach lift wire or chain to proper hole in lever arm, which will allow wires and ball to move freely. Turn off the water supply and flush the toilet to empty tank. Remove old float ball or rod by unscrewing counter-clockwise. Replace with new part and turn on the water supply. If the water level is too high, adjust by bending float rod down or, if too low, bend the float rod up. Be sure to hold float rod with both hands when bending to prevent damage to the ballcock. Turn off the water supply and flush the toilet to empty tank. Unhook top lift wire from the flush lever, then unscrew bottom wire from tank ball and slip out of guide arm on overflow tube. Slip new bottom wire through hook of top wire and through guide arm. Screw onto old or replacement tank ball. Attach top wire to flush lever and check to see that tank ball seats properly. If necessary, loosen and adjust guide arm to seat tank ball properly in flush valve. Turn off the water supply and flush the toilet to empty tank. Remove chain from the flush lever. (If you are replacing a tank-type ball with a flapper assembly, remove the old ball, lift wires and tank ball guide arm, and discard.) Remove old flapper by sliding it up and off overflow tube or, for new plastic flush valves, bend flapper ears out and off pins on the valve. Replace new flapper by either (1), sliding it down over overflow tube until ring touches the bottom of the tank and then adjusting the flapper along lines marked “Cut” or (2), slip ears of flapper over pins on the flush valve. Reattach chain to flush lever, adjusting the length as necessary. NOTE: Valve opening on brass flush valves should be cleaned with emery cloth or steel wool to remove corrosion and ensure that flapper ball seals properly. Turn off the water supply and flush the toilet to empty tank. Remove spring holding refill tube in place, unscrew lift wires, and remove. Unscrew overflow tube and remove guide arm by loosening the screw holding it to overflow tube. Slip guide arm on the new tube, screw tube into place, adjust guide arm and replace lift wires, refill tube, and spring. When adding a tightening overflow tube, be careful not to strip threads by overtightening. A little pipe joint compound on the threads will provide a watertight seal. Turn off the water supply. Flush toilet to empty tank and sponge out excess water. Disconnect lift wire or chain from flush lever handle and refill tube and spring from flush valve. Unscrew ballcock coupling nut and disengage water supply tube. Unscrew nuts from tank-to-bowl connecting bolts and carefully lift the tank off the bowl. Unscrew flush valve locknut and remove the old flush valve. Thoroughly clean tank bottom around flush valve area to ensure that new unit seals properly. With the tapered end of flush valve shank washer pointing down, insert discharge tube of the new flush valve through the bottom of tank and screw on new locknut and tighten securely. Make sure overflow tube of flush valve is in the proper position. Reconnect tank to bowl and water supply tube to ballcock. Reattach lift wires or chain to flush lever and refill tube from ballcock to flush valve. Fill the tank and check for leaks. Be careful not to over tighten bolts and nuts, as this will crack china tank or bowl. Turn off the water supply. Flush toilet to empty tank and sponge out excess water. Unscrew ballcock coupling nut and disengage water supply tube. Carefully pry off bolt caps and unscrew nuts securing bowl to the floor. Carefully lift toilet straight up until bolts in the floor have cleared bowl and place toilet aside. Remove the old wax ring and clean seating area and toilet floor flange to ensure a good seal. Place new wax ring squarely over floor flange ring. If the new ring has a tapered end, insert this directly into the floor drain pipe. Be sure flange bolts are positioned properly in the floor (a little putty will help hold them upright and in place). Lower toilet onto the wax ring, pressing down with a slight rotating motion and allowing your body weight to set the bowl into place and ensure a tight seal by the wax ring. Slip washers over the bolts and tighten nuts gently until the bowl is secure. DO NOT OVERTIGHTEN as this could cause china bowl to crack. Replace bolt caps, reconnect water supply tube and seal outside bowl edge to the floor with putty or bathtub caulk. Turn off the water supply. Flush toilet to empty tank and sponge out excess water. Remove the refill tube from ballcock. Unscrew coupling nut and ballcock locknut. Lift entire ballcock and float assembly from the tank. Clean tank bottom where ballcock shank washer seats to be sure of a good seal. Insert new ballcock and tighten locknut, being sure float rod fitting faces the right direction. Attach the water supply tube with the coupling nut. Screw float rod fitting assembly into place and reattach refill tube. Turn water on, fill the tank and check for leaks. Water level can be adjusted by bending float rod up or down. Turn off the water supply. Flush toilet to empty tank and sponge out excess water. Unscrew ballcock coupling nut and disengage water supply tube. Unscrew nuts from bolts connecting the tank to bowl and carefully lift the tank off the bowl. Remove old washer and thoroughly clean area to ensure that new washer will seal properly. Insert new washer in bowl opening, tapered end down. Carefully replace tank on the bowl. Using new bolts, nuts, and washers, secure tank to the bowl. Be careful not to crack china tank or bowl by overtightening nuts. Reconnect the water supply tube to ballcock. Turn on the water and flush the toilet to check for leaks. Your Plumber Guys is the best choice when it comes to looking for a Plumber in KL and Selangor area. We provide fast, reliable and affordable solutions to all residential and commercial plumbing problems.